If you are looking for a cool and calm place for a short break from Dubai’s busy life, there is a new option to explore — Eastern Europe’s Macedonia. Two months ago, it was not advisable to visit the country as there was no direct connection from the UAE. But now, thanks to flydubai, going there is easy with new direct flights to Skopje, the capital of Macedonia. The country itself is not very expensive for tourists like other European countries, and Dubai’s low-cost carrier has made it more affordable for Gulf residents who love to explore new places. Macedonia is a landlocked country in the Balkans; it offers a lot for tourists, especially its welcoming capital city Skopje and Lake Orhid, which is called a jewel in the crown of the country. It is rich in cultural, historical and archaeological heritage, has warm, dry summers and autumns, and relatively cold winters with heavy snowfall. Skopje is a modern city with a population of almost one million and presents Macedonia’s major political, economical, educational and cultural centre. The capital suggests something to suit all modern tastes and appetites. It features well-established hotels, restaurants and cinemas, as well as shopping malls usually at lower prices than in Western countries. The water here is eminently drinkable and the food hearty and nourishing with all international tastes represented — in addition to, of course, the excellent local cuisine. It is also one of the safest cities in Europe. As the country and capital is very small, there are a couple of places that tourists can see by walking in a day, if you start from the City Museum. Founded in 1949, the museum is a cultural institution in the capital that is located in a former railway station that was partly destroyed by a 1963 earthquake. Exactly on July 26, 1963 at 5:17am, Skopje was demolished by a catastrophic tremor. The epicentre of the earthquake was today’s Macedonia Square. Leaving the museum, our guide took us through Dimitar Vlahov Street, which was converted into a pedestrian street in 2011 and leads to Macedonia Square. The biggest in Macedonia, the square is located in the central part of the city, and it crosses the Vardar River. Next to the square is the Stone Bridge across the Vardar River. The bridge is considered a symbol of Skopje and is the main element of the city’s coat of arms, which is also incorporated in the city’s flag. The Stone Bridge connects Macedonia Square, in the centre of Skopje, to the Old Bazaar, the largest in the Balkans outside Istanbul. Close to the bazaar is the Mustafa Pasha Mosque, built in 1492 one of the most beautiful mosques. Major attractions of the city are all located within a remarkably concentrated and again eminently walkable area. It has the narrow streets of the Old Town lined with restaurants and cafés perfectly suited for relaxing in the cool summer evenings. The city of the immortal Ohrid is the sublime lakeside point that for many represents the culmination of the Macedonian experience, a kingdom of light and water, a repository of ancient ruins from Macedonia’s earlier kingdoms. As for the lake itself, it is so large and so deep that one might mistake it for a small sea. A full range of water sports like fishing and boating is available, and numerous churches alongside Ohrid’s lakeshores make for fascinating side trips and walks. 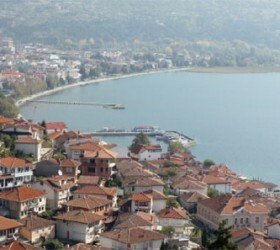 The uniqueness of Lake Ohrid and the city’s historical architecture has been attested by the Unesco, honouring it with an official designation as one of the few places on its World Inheritance cultural institution list.